The man in between the double mirrors is homeless and considered insane, yet I am sure he is the most enlightened man I've ever met. 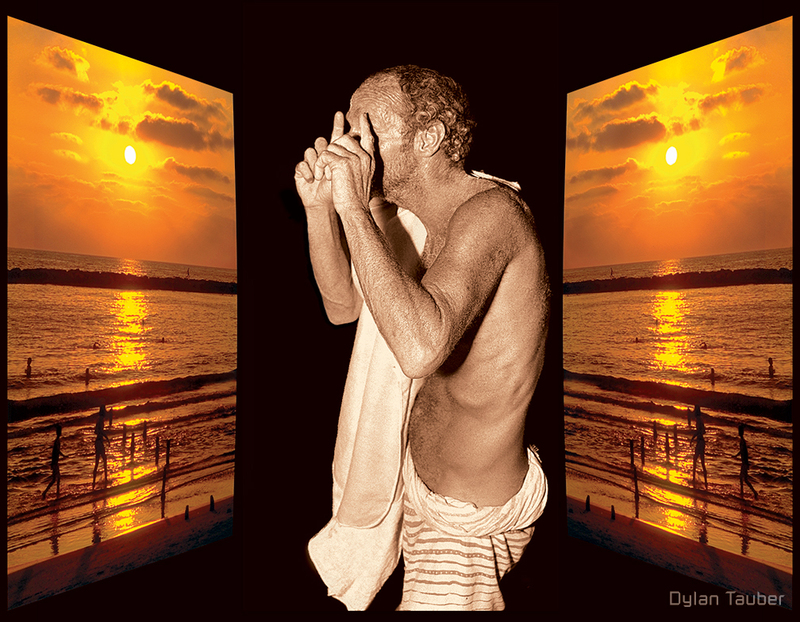 As I photographed him on the beach in Tel Aviv that night, he performed hand movements, lost in his own world, seemingly oblivious to the fact he was being photographed. To me, his gesture, fingers pointing upwards towards the moon, reveals the focus of the visionary. He is positioned between the parallel mirrors of sunsets over the Mediterranean Sea, an image which expresses transcendence through the ocean- through nature. Nowhere is the spiritual evolution more apparent to me than in the transition in Judaism from Old to New Jew. I could talk about the theoretical role of Double Mirrors in groups all day, but what better way to give my words meaning than by talking about an actual society which, by means of 4,000 years of human experience has become a macrocosm of every idea I am speaking of. What better way of understanding humanity than to first examine the people that represent the overdose of humanity (i.e.. self reflection)- the Jews. I admit that I might be an idealist. It is possible that the New Jew no longer exists en-mass in Israel. Certainly recent events such as the assassination of Prime Minister Rabin wounded this collective spirit. Perhaps the New Jew only existed for one moment, in the country's history. But a moment like this never dies. The lesson that can be learnt by spiritual revolutions like the one in Israel is universal. New Jews are Buddhist, Catholic, and Ethiopian too. Ultimately, man's perception of God is a problem greater than any religion. Old and New "Jews" can also be found hiding in Christianity, Islam, and every other religion. Moses, Mohammed, Jesus and countless other prophets might have been legitimate visionaries, but the need of the masses for a Yoda figure- an old wise man thought to possess the meaning of life- led to so much focus on the messenger that the message was lost. When all the rhetoric and dead dogma is put aside, man's vision of the infinite- God/love/truth- exists independent of organized religion, and is in fact rooted in the inherent double mirrors of our individual minds. Regardless of how each of us chooses to conduct and express our spiritual search, its ultimately goal is universal, as we are all equally trapped in our physical bodies even as we peer out at a vision of infinity and the spirituality. The debate over how to deal with this paradox is as old as our oldest historical documents, and will persist so long as we maintain our elusive vision. (Meanwhile, the chimpanzees will continue to happily chew their peanuts without being plagued with such troubles.) We must look past the shadows and follow the example set by New Jews all over the globe: by creating harmony in our souls, as well as all around us; by sacrificing for the community: and by becoming one with not only the world around us and with nature, but with ourselves. In short, we will escape the cave by revolving our lives around love. If anyone could become immortal it would be he. . . .